Alec Farmer, a graduate student in Glasgow, Scotland, is spending a year living in a micro-structure and is blogging about his experience on the new UN v2.0 site. 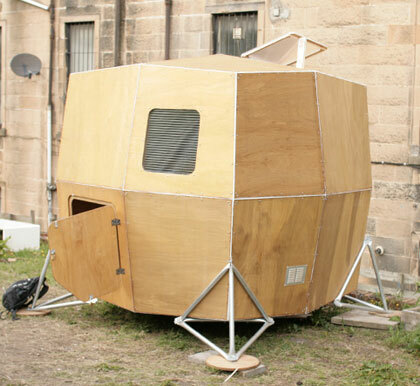 The UN in the blog title is an abbreviation for urban nomad, and it aptly describes Farmer’s interesting project in small-space living. The structure Farmer built to live in for the year was designed more than 30 years ago by famous minimalist architect Ken Isaacs. Having studied [the Urban Nomad] subject for a few years now, one can only speculate so much. Reading can only get you so far, before you have to take another step and actually try it. So thats what I’m doing. Follow along on Farmer’s micro-structure living journey at his blog UN v2.0. You also can download a free copy of Isaacs’ How to Build Your Own Living Structures through the PDF library at The Pop-Up City. This document includes architectural plans to a few micro-structures designed by Isaacs. Wow – now that’s minimalist! It looks like an Apollo Lunar Module made of plywood. Here is my problem with a lot of these micro-structures: the main purpose of a room on campus is to have a safe, dry, mostly theft- and assault-proof space to sleep and leave your stuff. This little pod looks like a couple of drunks could just lift it up and drop it in the river for a prank, so it fails the most basic test of housing – protection. Here is my problem with a lot of these micro-structures. They are not self-sustaining; being rather parasitic on adjoining structures. One can do without electricity; but not without basic sanitation. If you don’t have a water source, a means to heat the water and a means to dispose of waste (human and otherwise) then it is not viable. It looks like a wooden tent. Perhaps it will suffice during good weather but how will it function during torrential rain or during winter snows? @toddes — I wondered about rain and cold, too. Since the walls aren’t insulated, my guess is that he’s going to have condensation on the inside of the walls when it is cold outdoors. I assume he used treated plywood, so the rain likely won’t be an issue for one year, but could be if he continued the project for multiple years. It will be interesting to discover the flaws of the design over the duration of his project. Microstructures can be as safe, comfortable, and durable as larger ones, it just requires attention to engineering. If you can fit out a small sailboat as relatively comfortable independent living for two, you can fit out a similar space on land with the added benefit of having surrounding land to grow vegetables. Solar and wind can generate electricity, and a composting toilet or digesting tank can deal with waste and wastewater. Im glad that this has stirred up some debate! In fact, the house will be insulated using thin and flexible roofing insulation (not glass-fibre or anything like that!). I treated the wood to allow it to be waterproof while maintaining some of its natural breathability. It has solar panels on the roof, and I am developing a wind turbine made from old washing machines, that anyone can find on the street. In september, it will be situated on a community garden in the heart of the city. Here I will build a composting toilet and also grow vegetables. Water, unfortunately, I will have to ship in using barrels, but that will enable me to keep a more watchful eye on consumption. I have built a shower inside, using an orchard pump, so that it uses no electricity. I have a small gas burner for cooking, and potentially heating also. Because the space is so small, it heats up very quickly just with bodyheat, and the fact that the interior is subdivided into sections restricts some of the airflow, allowing certain areas to be heated individually. Sure, people could probably break into it, but people break into cars and houses anyway. And I might get trouble from drunks, but if I spent all my time worrying about a tiny segment of society, I would never have done the project. Im putting my faith in the general public and the community I am living in to be responsible. Some people may not be, but I would rather account for the better people, who care about these projects, than those who are ignorant or unkind. Society has existed for millions of years without brick-built houses with central heating and swimming pools. Im not sure that we, as a race, are any happier now that we have these things. This house is only unusual in todays society. That doesnt mean that it is inherently flawed. Looking at this and the other microstructures in the links, I have this niggling question of “what here wasn’t done better a long time ago by the Japanese?” Not to mention classical Japanese architecture is far more aesthetically pleasing that this. They’ve been living in beautiful, minimalist structures for centuries, and in the process produced some of the greatest architecture known to man (example: Katsura Rikyu). I’m trying to figure out how you sleep in it. Will you sleep sitting up?? I don’t see a lot of room to lay down and sleep in the picture. Haha, there is a bed platform that is 8′ x 4′ . Its actually pretty massive and luxurious!! And yes, the japanese have been doing this for centuries, but it is really interesting to see how their ideas can be reappropriated in different environments. The aspect that appeals to me about this experiment is learning how Alec adapts to living with fewer possessions, and what he learns about himself in that process. It’s tough enough for astronauts/cosmonauts to stay in such a small space for a few weeks or months, so courage to you for trying, Alec. I hope it goes well and your shelter is sturdy. And I also want to thank Erin for writing about this and by extension, alerting me (a space geek) to the project. Given that it looks like a lunar module I ended up writing a piece about this project on my own blog, Pars3c. Here’s the link for anyone interested. I couldn’t do it, but I am very interested in keeping up with Alec’s blog. I already have it bookmarked. Things like this are so interesting. I have long been fascinated with cob houses and straw bale houses. I lived in an adobe house in New Mexico for several years. It was great, because the insulation was so fantastic. I miss it.